Author Stephen Maitland-Lewis has tasted what life has to offer. He has seen up close the connection between wealth and power. He has made and lost fortunes, leaving him with the heart and wisdom that makes him capable of writing such a fascinating character as Henry Brown in a convincing, provocative and affectionate style. 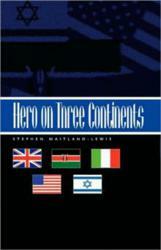 Henry Brown’s story unfolds in Hero on Three Continents. This book is a chronicle of a century with the protagonist Henry Brown participating in events both cataclysmic and personal, and interfacing with characters both famous and imaginary. From the jazz age of the 1920’s to the war-torn 1940’s, to the international crises of oil and terrorism in the 70’s, this novel makes history intimate, the work of any epic. The world needs a hero, and Henry Brown is such a man. Maitland-Lewis demonstrates the importance of uncompromising research as well as the art of presenting material in a fast-flowing, enjoyable, “can’t put it down” style. Stephen Maitland-Lewis, a full-time writer, divides his time between Los Angeles and Palm Springs. An attorney and former international merchant banker, he left London to become the general manager of an investment bank in Kuwait. Subsequently, he held senior positions on Wall Street before moving to California in 1991 where he owned a luxury hotel and a world-renowned award winning restaurant. He is a jazz aficionado and an art and theater buff.